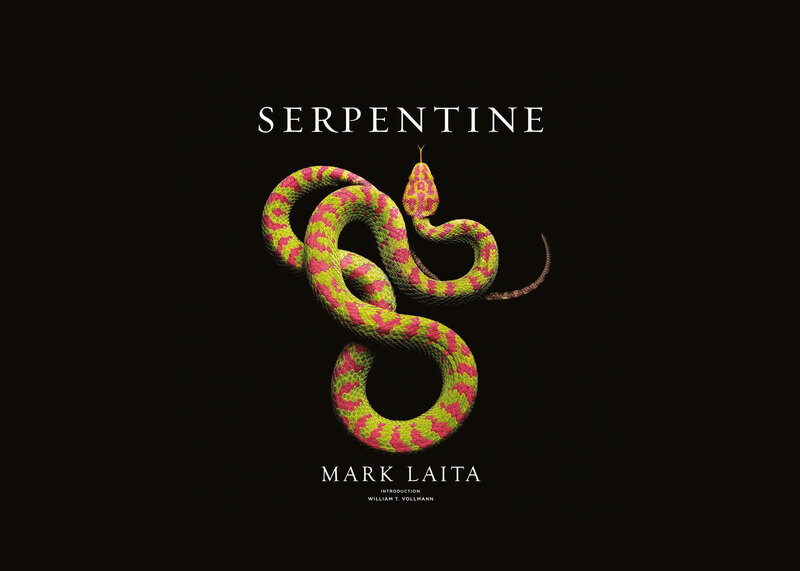 Mark Laita is a magnificent photographer whose studio work is of the highest quality. 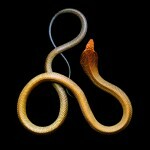 A master of combining subtle backgrounds, colorful subjects and superb lighting, Mark has photographed a plethora of products, people, and animals — such as snakes. 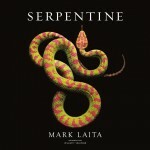 In his book ‘Serpentine’ Mark contrasts wonderful color and texture against starch black backgrounds with aerial views showcasing the legless reptiles mathematical curves and coils. Photographing everything from garter snakes to a king cobra, his leg met fang with Africa’s longest-venomous snake the Black Mamba. 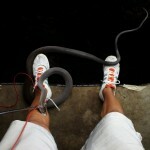 After the mamba decided to get a little intimate coiling around his leg, Mark asked the handler to take the mamba who was spooked when the snake hook touched a red camera cable hanging close by. Luckily, the mamba did not release it’s venom allowing Mark to continue his work. Mark attributes the snake not releasing the venom “to hold it for something it was going to eat.” Whatever the reason, we’re thankful for the work he’s done and can’t wait to see what’s to come — hopefully with less life threatening encounters. Mark being bitten. Photo by Mark Laita. Canons new 35mm video sensor. 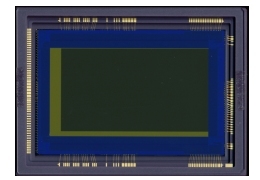 Canon is shooting for the stars with their latest development in camera sensors. Looking to make one giant step for sensor kind, the camera powerhouse says the new sensor can capture video in as low as 0.03 lux illumination. To give you an idea of the lighting scenario, a full moon on a clear night ranges from 0.27–1.0 lux. This development looks at “future applications for the new sensor as astronomical and natural observation, support for medical research, and use in surveillance and security equipment,” with the sensor being revealed at Japan’s Security Show 2013. Hopefully we’ll see these developments make way to the digital camera video realm — perhaps a wish on a shooting star? 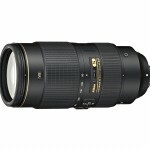 Nikon released a much anticipated update to their telephoto line, the Nikkor 80-400mm f4.5-5.6G ED VR Lens. With a planned April 2013 release and $2699.95 price tag, the new will fit FX, DX, FX in DX (crop mode), and 35mm film formats. The new 80-400 has a minimum aperture of F4.5 – F5.6, a max aperture F32.0 – F40.0, adds a built in AF-S motor with 4-stop vibration reduction — a Silent Wave Motor (SWM) that will keep your lens quiet when locking onto your subject. 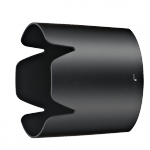 The lens fits 77mm screw-on filters, weighs 56oz (1570g), measures 3.8″D x 8.0″L (95.5 x 203mm), affixed lens collar, and comes with a HB-65 Lens Hood, front/rear lens caps, and nylon case. Compared to the old 80-400mm via specs the lens looks promising, but we’ll have to see some test images before handing over the extra $1000 (~770€). 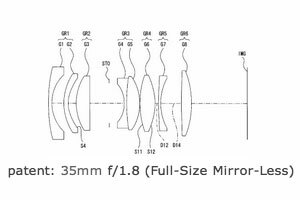 Sony 35mm FFML lens patent. What do you get when chop up a Nikon DX DSLR and Nikkor lens, then ‘Frankenstein’ them together? The Nikon Coolpix A. With a compact 18.5mm (28mm equivalent in 35mm standards) f/2.8 lens and 16.2mp sensor (Niknon DX format CMOS), the compact power house is aimed to conquer the hearts and hands of those looking for a portable, yet capable, camera. 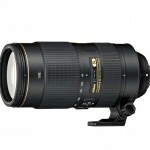 The camera is adaptable with many Nikon accessories including speedlights, wireless remotes and lens accessories. The camera has the main DSLR exposure controls (auto, program, shutter, aperature, manual), Coolpix scene mode, two user modes, and with an auto/manual focus lens. The camera will undoubtedly be a no-brainer for Nikon DSLR owners looking for a strong compact within the same manufacturer system, although the $1096 price tag may cause some to prefer to deal with their DSLRs bulk and put the money towards a new lens, accessory, or car payment. There is no denying, however, the camera captures some incredible photos. Float like a butterfly, sting like a D — X.